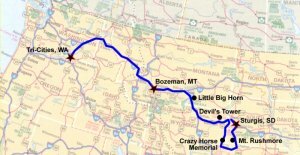 Somewhere around last October I began considering a cross country trip on my bike. It’s something that I had always thought would be an ultimate trip but never had the funds, was in the Navy, starving undergraduate, or family man. At 54 the kids are all grown, I’ve got a bike, and my wife is…ok with it. Plotting a Course and How Long Will It Take? At first I looked at tourista type places of interest but didn’t find much of interest there. For one thing I wouldn’t have time to spend in any one place so they had to be quick stops or the trip would take me months or years. I was thinking in the 3 week range. I think the old body will be pretty dilapidated after that long on the road, especially if I’m camping out most nights to cut costs. First thoughts were the following. It might seem that six stops is a good number. that’s three on the way and three back. Past experience tells me 300 miles is a good average for long duration rides. I’m hoping to keep it to three weeks so making anything like 400-600 a day would be difficult. Overall the mileage is going to be between 6,500 – 7,500 miles. That’s over 1,000 miles/3+ days between the current interest points. I’ll need more than that. Plan for separations. It’s not a crisis to get separated but if you plan well you won’t waste a lot of time: Exchange cell phone numbers, all riders should have maps, decide what to do when you are separated (for us, the person in front stopped at the next wide spot/off ramp and waited for the followers to call. Make sure all riders know the rules of group riding whether you create your own or follow custom. The day was heating up in St. Regis so we peeled off as many layers of garments as we could. Aaron soaked his clothes with a garden hose and I poured my bottled water over the top of my head a let it flow down under my shirt. Both of us hoped to use evaporation to stay cool. It worked, for about 5 miles. The heat was really on in Coeur d’Alene so we rested in the shade and drank a lot of water. Our last stop before home was Ritzville. We said our goodbyes there and drove to the Tri-Cities. We arrived in the Tri-Cities about 9 PM. I’ve discussed our first Sturgis ride with Tom a few times since and we agree, the first ride with Aaron was the most memorable. Everything was new and crazy. Now we know what to expect and it doesn’t seem so crazy. Thursday morning we completed packing, checked our loads then drove out of Buffalo Chip at 0800. Traffic was light through town that early in the day. I took the lead onto the freeway and we planned our first gas stop for Spearfish. From Spearfish Tom took the lead and we drove back roads to Devil’s Tower. We stopped in Hulett where a community group was offering breakfast to bikers and the streets of this little town were lined with bikes. After Hulett we continued into the hills away from I-90 toward Devil’s Tower. I caught an interesting photo of it in the distance from the road. You can see it just peaking over the hills from the horizon. We stopped for gas in Gillette, Wyoming. A biker parked a few spaces from us and just sat on his bike. He was a small older fellow riding an old, Low Rider. Aaron walked over and asked if he could take the guy’s picture. At first he just looked at Aaron like, “What in hell do you want?! ?” Then it dawned on him that all Aaron wanted was a picture so he slowly straightened up and gave a half smile. It turns out he was 70 years old. 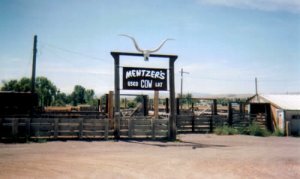 Having just left Sturgis he was returning to New Mexico. The day before, while riding twisty roads, his foot peg caught the pavement and flipped the bike on top of him. He had three broken ribs and was in obvious pain. Slowly he got off the bike to take a break and could barley get his leg over the already low seat. 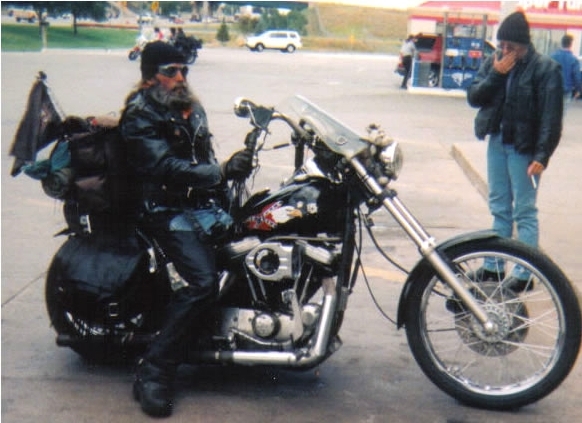 Of all the people we had seen and met on our Sturgis trip, this guy was the epitome of a real biker. 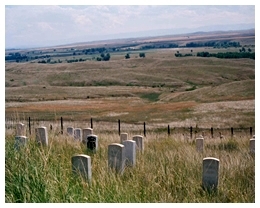 Our second stop of the day was at Little Big Horn Battlefield Nation Monument which is located about 50 miles SE of Billings, MT. We toured the museum for over an hour and looked out over the battlefield. As I think back on it, this riding day was probably the most event filled. 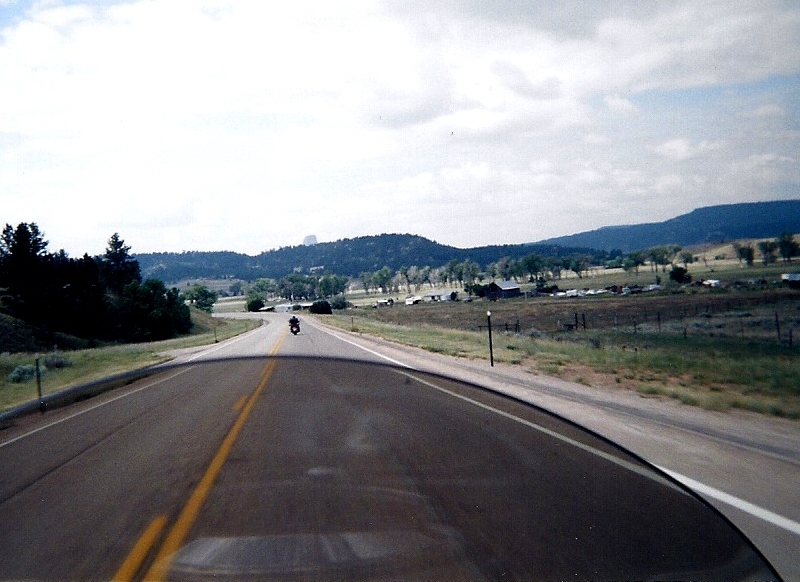 The old biker, Devil’s Tower, Little Big Horn, and more was to come. Later we ran into two groups of banditos. They didn’t give us any attitude but neither were they warm and friendly. One of the encounters occurred when Tom accidently got suntan lotion in his eyes causing his eyes to burn. The wind had also peeled a couple layers off his eyeballs due to his 3/4 helmet. We pulled off the freeway into a gas station so Tom could use my duct tape in an attempt to extend his visor and keep the wind out of his eyes. The duct tape was fluorescent orange, but Tom was glad to have it until one of the groups of Banditos pulled in and began watching him. They were shaking their heads and saying stuff like, “No need to worry about being seen.” I think they were being sarcastic. I moved away from Tom and shook my head like I was as disgusted as they were. This was our longest riding day, 14+ hours, due to our tourista stops. We didn’t hit the mountains before Bozeman until night fall and it got cold. We were being bombarded by night birds and there were several close calls until Aaron finally center punched one. I was riding behind him and watched the bird fly straight up into the air after impact and disappear into the cold night. Word must have gotten out because after that there were no more close calls. It was about this time I began hearing an engine noise. It had started earlier but got louder about a hundred miles out of Bozeman. Wonderful. Tom’s blind, Aaron’s on edge after the bird incident, and I’m wondering if my bike will make it to Bozeman let alone home. Bozeman was a welcome site. Wednesday morning was cool but sunny and began to warm quickly. Tom and I drove to the amphitheater and parked near the food vendors. I pointed to two motorcycles parked near ours. Both were “Rat Bikes”, however, one was much further along in its quest for rat bike status. Next to the bikes were two sleeping bags with, presumably, a human in each. Garments were strewn about the make-shift camp including one boot haphazardly lying near one of the bodies. What ever they were, they were sleeping on the gravel in the parking area and obviously not bothered by the noise of bikes driving past and spectators gawking at them. The “rat” bikes deserved their names if dirty, rusty, and loaded with junk is a requirement. One had a custom gas tank welded from sheet metal into a box shape. Other custom features included 1×3 pieces of wood wired to the frame for floorboards and a device cleverly mounted to the back wheel to run a blender. 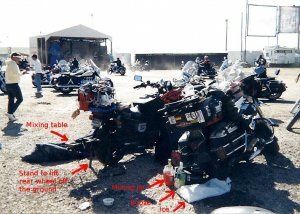 Behind the bikes were two 1/2 gallon containers of whiskey and an open jug mostly full of some concoction ready for consumption upon the owner’s waking. We wondered if he would be upset by the flies floating on top. Considering the scene…probably not . 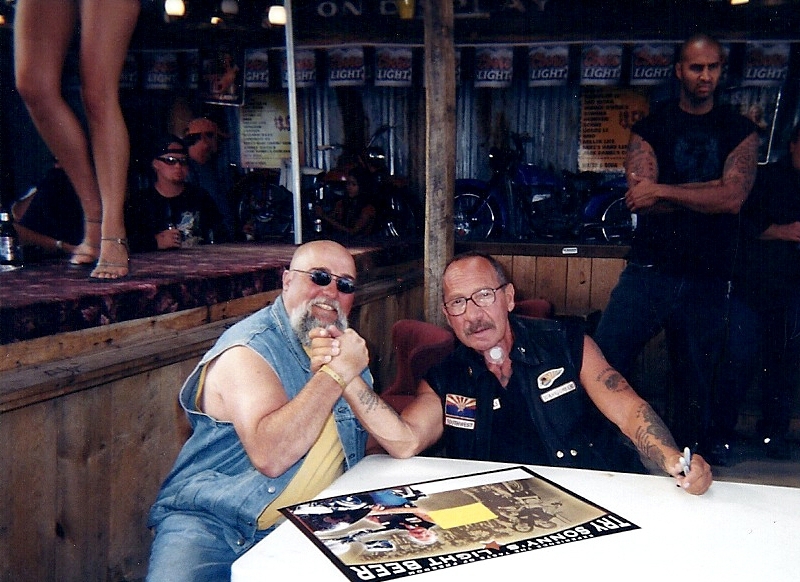 A highlight of our day was meeting Sonny Barger. Sonny is known for his role as Oakland Chapter President of the Hell’s Angels MC. Now, in his early 70s, he still commands respect. Other bikers treated him like the Godfather of bikers, almost kowtowing to him. The Broken Spoke set up his table with dancers on a bar above him and bouncer types near by. When I finally got to meet Sonny, I considered asking him if he would like to join the Bad Teacher RC, then thought better of it. Tuesday morning it was cloudy and cool, so we dressed warmly for a day of riding. After breakfast we joined the line of bikes stretched from the Chip, through town and into legendary Deadwood, about 20 miles south of Sturgis. Streets in Deadwood were also filled with bikes and their riders. During the trip that day it became apparent that every town within 100 miles of Sturgis was overrun with bikes. Mount some 50 calibers, pass out a few RPG launchers, and I think we could have occupied Iraq. 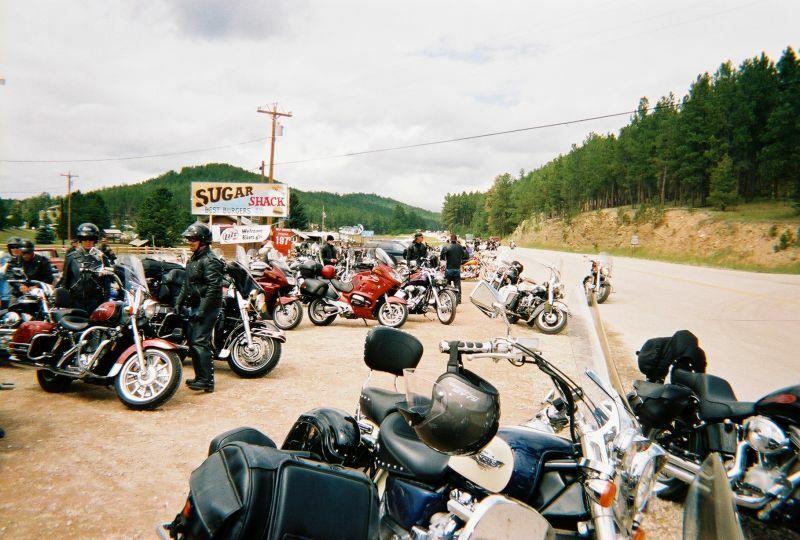 We stopped at The Sugar Shack on Highway 385, a popular biker hangout in the Black Hills. They serve excellent burgers. Our second stop was the Chief Crazy Horse memorial. Construction of this monument has continued for over 50 years. It could be another 100 years before work is done. The Chief’s face is closest to completion but other features are barely defined. The next destination was Mt. Rushmore, which was also spectacular, but not to the level of Crazy Horse. Rushmore will fit inside the opening between Crazy Horse’s arm pit and his horse’s head. 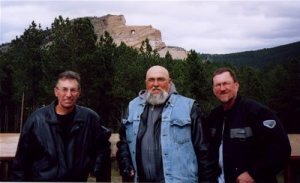 From Rushmore we rode to Rapid City and back to Sturgis. This was a great riding day with more fun to come. We still had the Pitchfork Fondue and Beach Boys to look forward to. The fondue consisted of buffalo steaks soaked in a hot marinade and then flame grilled. 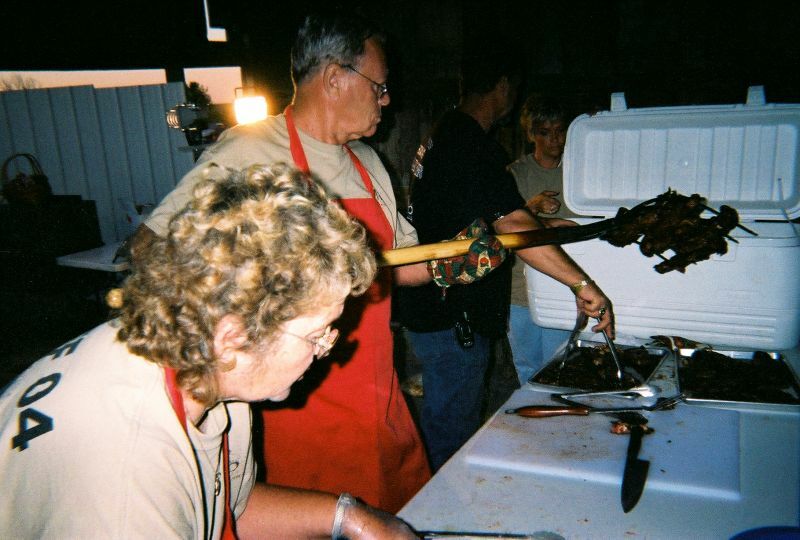 Movement of the meat from pot to grill was done by pitchfork, of course. The dinner was ok, but was followed by an entertaining biker hypnotist who asked for volunteers. Tom volunteered but did not become hypnotized. He was excused from the stage and rejoined us to watch the successfully hypnotized folks act out as instructed. At 2030 the Rock and Roll All Stars performed and at 10:30 the Beach Boys came on. The evening was cold enough to wear all my layers and leathers to the concert. 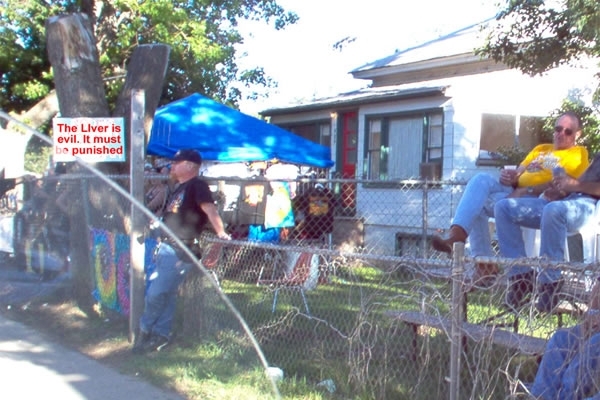 I had wondered how a hippie/surfer band like the Beach Boys would work at a place like Sturgis. It didn’t take long and they had the bikers revving their approval via unbaffled exhausts throughout the Buffalo Chip Arena. They put on a great show but the cold was getting to them, too. Hawaiian shirts and shorts could not have been comfortable that night. 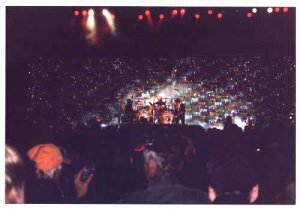 After the show, the MC announced that the Sturgis motorcycle rally “…would be held in the summer next year”. It was cold that night. When Tom woke at 0500 and checked outside, there was frost on the motorcycles. Yes, It froze in Sturgis in August. The burnouts and engine revving tapered off, but didn’t really stop. We woke at 0600 to a Harley parking next to us and revving its motor. It was Reveille at Sturgis. We crawled out of our bags and rode to the arena to find coffee and breakfast. Taco time offered breakfast and other supplies were available at the General Store. This day was to be spent in town checking out the vendors, shops, and bikes. It was afternoon before we got to town. We parked our bikes at the edge of town at the city park and walked the mile into town. Every street in town was lined and filled with the thousands of bikes gathered for the event. We looked at t-shirts, patches, pins, hats, custom motorcycles, motorcycle accessories, and biker bars. Two made claims to be the “World’s Largest” bars – you could drive your bike inside and park it. 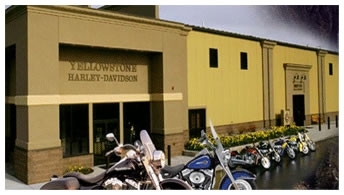 It became apparent that Sturgis is largely a Harley Davidson convention with a significant percentage of motorcycles in attendance being Harley variants. Un-muffled variants. And the Harley riders love to demonstrate just how loud their pipes are. Often. Frequently. With vigor. Ear plugs were Tom’s friends. That evening, Aaron treated us to MREs for dinner. We were all out of practice with MREs so it was a bit of a kluge preparing and eating them out on the prairie we were calling home the next few days. After dinner we walked to the arena with our chairs and set up in anticipation of the ZZ Top concert. We wandered among the vendors for a while then at 10:30 PM, the concert began. ZZ Top played until after midnight providing the best concert of the Rally. By 0100 we were in bed. It rained during the night but our tents kept us dry. Sunday morning was pleasant as we loaded our gear and left town about 8 AM). Our gas stops were in Columbus, Hardin, Sheridan, Gillette and Spearfish. That probably seems like a lot of stops for 500 miles, but we were playing it safe and guessing our way at gas stops, plus 75-100 miles was about the furthest our butts could stand. We tried to gas up in Reed Pt., MT but it was almost a ghost town. As we drove through, the only living thing was a dog laying in the street. He didn’t even raise his head as we passed by him not 10′ away. He finally raised his head on our second pass. There is no gas station in Reed Pt. No vacancies in the motel either. The speed limit was 75 mph on I-90 but we tended to push it. Most of the day was spent watching the scenery fly by at 80 and sometimes peaking at 95. During each gas stop Tom and I would be thankful we’d survived the last leg and swore to keep the speed down, but, next thing we knew, Aaron had us flying again. A friend had predicted that arriving in Sturgis would be like ants streaming to their ant hill. As we approached, each gas stop had greater numbers of bikes and riders. Within 100 miles of Sturgis the freeway was pretty much a continuous double line of bikes stretching to the horizon like a giant biker club from an old “B” biker flic. We could see bikes coming off the low rolling hills, driving along the freeway frontage roads and every on ramp brought new members to the club. We hit Sturgis at 1700 Sunday afternoon. Saturday, when we met, we were anxious to start so got on the road by 7:45 AM. We weren’t actually absconding but I think a couple of us were escaping irate wives. The morning was sunny and warm with little traffic out of town. We stopped for gas in Ritzville where we talked to some other riders who told us that Evil Knievel would be at Shumate Harley in Spokane that afternoon which was on our way. We stopped in Spokane in hopes we would see Evil but he wasn’t due to arrive until several hours later. We still got to see the rocket in which he attempted the Hell’s Canyon jump. It turned cloudy and cool and there was a misty rain near Lookout Pass at the Idaho, Montana border. 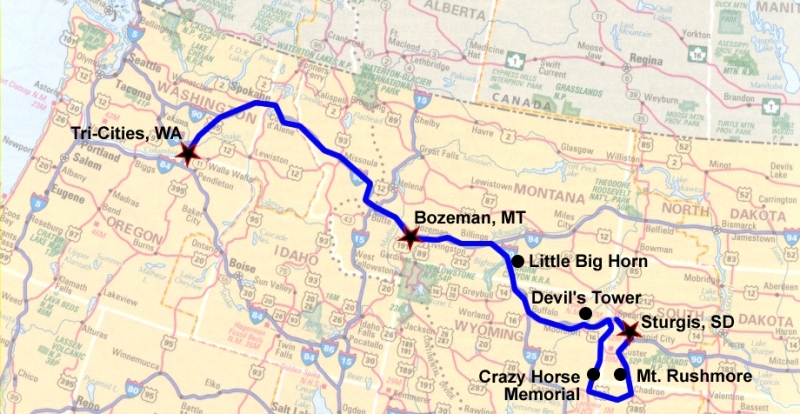 We stopped for gas in St. Regis, Drummond and Whitehall before arriving in Bozeman about 7:30 PM local time. We had been on the road about 11 hours and covered about 550 miles. After checking into the Super 8 motel and unpacking we had dinner at the Panda Chinese Buffet. It didn’t seem like a “goin’ to Sturgis meal” but did fill us.